It’s been an active month so far in finding old keyboards at rock bottom prices. This week I found a mint condition Yamaha SY-85 for a price I couldn’t refuse. The only problem was that the floppy disk drive needed a new floppy drive belt which I had an extra already. I replaced the drive belt and now the floppy disk drive works perfectly. Hopefully it will last for quite a while. I checked everything around the synth and so far I have yet to encounter any additional problems. 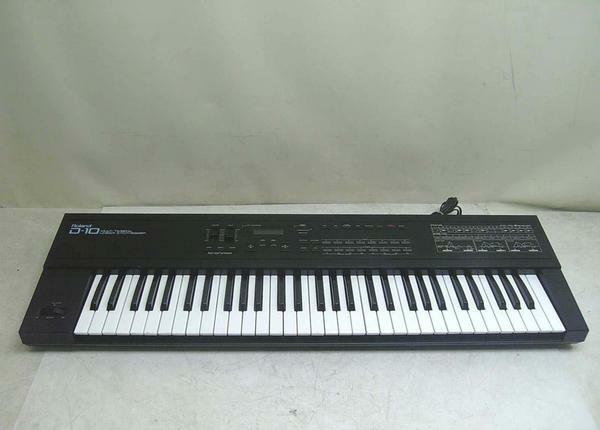 The SY-85 is different than my Yamaha SY-77 but that difference makes the Yamaha SY-85 a good synth in it’s own right. I really like for the most part the sounds on the SY-85 and I love the ram memory expansion to load and store your own samples with. In fact, I just bought two Sector101 SYEMB06 modules that will allow me to have 1.5 MB of total non-volatile RAM for storing samples. I will likely be able to convert and load up all kinds of Roland, Akai, and E-MU samples that I’ve collected. This should greatly enhance the sound palette and will allow me to create some new and unique sounds. The SY-85 is also built like a tank similar to the SY-77 which is always nice as well. 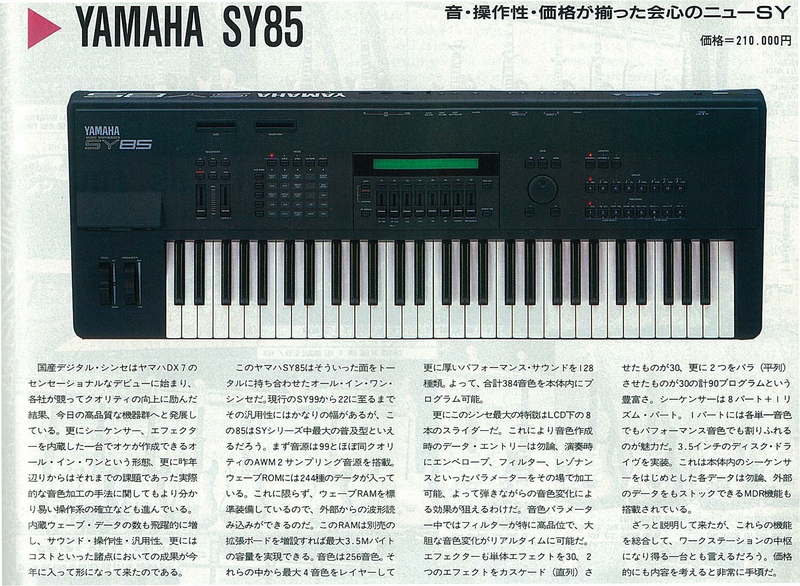 I find the Yamaha SY-85 to be a pretty cool “all around” or “bread and butter” type of synthesizer. It has sounds that are pretty much applicable to all sorts of music and from what I hear, it’s a pretty reliable synth. I was really surprised to find one in such great condition along with a case and manual. The key action is all typical Yamaha high quality greatness. It’s a real joy to play and I look forward to working more with the sample side of the SY-85 when the Sector101 SYEMB06 modules arrive shortly. That should be fun. Here is a pretty decent demo video of the Yamaha SY-85 in action including the use of it’s Ram sample memory. What’s great about the Roland HD-1 is that it’s small, light weight, portable. and incredibly easy for kids to operate. There are 10 good presets ranging from regular drum kits to Tr-808 style drums. The kids can easily push the big number buttons and adjust the volume as they wish. I run the Roland HD-1 through a Roland KC-150 keyboard amp and it sounds great. There is also a headphone jack and when in use the HD-1 overall is very quiet. The bass drum and hi-hat pedals are slightly different than regular drum kits, but the kids handle them very well. My youngest (5) can scoot in really close and play without any problems. I also looked at other Roland and Yamaha kits but they were much bigger and of course much more expensive. I usually try to buy used because I can get really great deals however finding used electronic drum kits is much more difficult than keyboards in Japan. I managed to buy the Roland HD-1 at less than half price for a new one so I thought it worked out well. The kids also seem to like the mesh snare drum rather than the rubber ones that Yamaha uses. I tried a few of the other drum kits in a regular new music store before buying the HD-1 and the kids seemed to really love the Roland HD-1. ( Note my kids are ages 8 and 5 ). In addition, I bought a used Yamaha DTXpress sound module and was successfully able to midi it up to the Roland HD-1. This expanded the HD-1 to include Roland sounds, sequences, and training material. The Roland HD-1 cannot trigger the DTXpress via the cables I think, but I it can certainly trigger everything via midi which is all I need right now. It also makes the Roland HD-1 a bit more professional and the kids love the additional sounds and features the Yamaha has while retaining the feel of the Roland HD-1. We enjoy layering the sounds as well with the DTXpress and other sound modules I have in the studio. 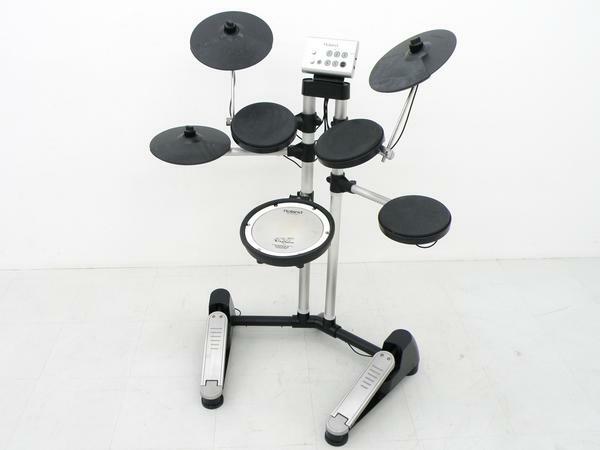 Plus later, you can even buy Yamaha Drum pads and attach them to the DTXpress to add additional pads to the overall kit. Pretty cool! When the kids play, they usually take turns with one playing the Roland HD-1 drums and the other the keyboard. You will be amazed at how fast kids will pick up drumming and improve their timing. In addition, the kids are really starting to key in and understand the differences between a hi-hat, snare, crash cymbal, bass drum, toms, and ride cymbal. Note that the Roland HD-1 does have velocity sensitive pads and I believe they are all 1 zone. So on the snare for example you can’t get a snare sound AND a rimshot. Honestly though, if my kids outgrow this Roland HD-1 then they will definitely deserve a higher end model. The Roland HD-1 is great for that “show me what you can do” spirit … laugh. The kids are loving the HD-1 though and myself included enjoy teaching them new drum grooves. It’s a real kick!!! 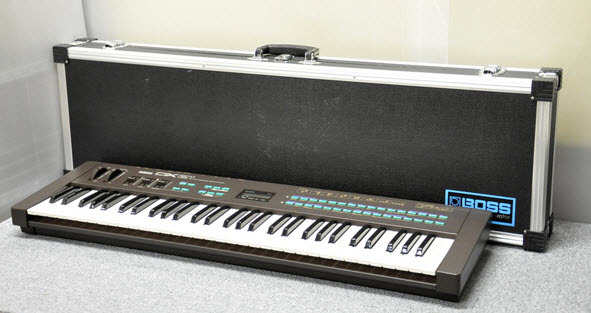 Over the weekend I scored a free Yamaha DX-21 and at another shop nearby I also found a Roland D-10 in amazing condition with an internal battery problem. As I often find in Nagano, the sales clerk didn’t want to be dealing with an internal battery issue, so he decided to dump the Roland D-10 on me for a price I couldn’t refuse. Case and all, the Roland D-10 got a new home and I have really found it to be a fun synth to play. The internal battery was quite easy to replace and pretty quickly I was able to get it back on it’s feet. The overall condition of this beauty is superb! What I really like about the Roland D-10 is it’s functionality. I can quickly sit down, turn it on, play a drum track, and then start playing a split keyboard with the bass on the left and an EP sound on the right. Sure, the sound quality takes you back to the 80’s, but as an 80’s music fan I don’t mind that at all. In fact it’s quite nostalgic for me because back in High School I paid a fortune for the Roland D-110 rack module when it first came out. The D-10 is the synth version and after playing it I wish I had paid a little extra and bought the D-10. At that time, it would have been great to have a built in drum machine with the ability to layer or split the keyboard. The 32 note polyphony is not that bad either, plus you get some decent basic effects. Here’s a fantasic Youtube video of the Roland D-10 in action. This video is another reason why I bought the D-10. To each their own I know, but I love this sound!! Last weekend I landed another free synth from the local used music shop I frequent. I found a case that I need for another one of my synths and stumbled upon this Yamaha DX-21 that had a $10 price tag on it. The tag said the DX-21 was broken with no sound coming out. I asked the clerk about it and he said that the power worked but that it then freezes with the “Yamaha DX-21 Synthesizer” message on the LCD screen. Plus there is no sound. As a result of buying a case, he decided to throw in the Yamaha DX-21 for free as he didn’t think he could sell it broken. He asked if I wanted it and I said sure thing! I didn’t know a whole lot about the Yamaha DX-21 but I thought it would be fun to try and fix it. When I got home I anxiously cracked open the Yamaha DX-21 and notice right away that the battery needed to be replaced. In fact, the battery was already starting to leak but nothing had reached the PCB board yet. I desoldered the battery and then soldered in a new battery holder as a replacement. I then did some quick cleaning of the contact areas and some parts of the PCB board that looked a little dirty. I finally put everything back together and fired up the Yamaha DX-21. Sure enough it turn on by using the reset procedure which is holding down buttons 1 and 2 while powering on the synth. The Yamaha DX-21 entered test mode and then I could proceed to load the internal ROM patches back into the 32 Ram voice slots. Everything worked perfectly and so I was excited to basically get a fully working Yamaha DX-21 for free. The Yamaha DX-21 surprisingly is a great little 4-OP FM synth. It has single and dual modes which allows you to layer or split the keyboard. There is LFO editing, portamento, and a nice sounding chorus effect built in. The body is is very strong and the keys play nicely. It can be a tad bit noisy, but I really feel it adds to the character of the DX-21 and so I welcome the noise it makes. In fact there are some internal presets that really sound cool with a little noise mixed in. It’s all about one’s preference, but I actually like having noise mixed in with FM sounds rather than having them perfectly clean. The Lo-Fi sound of the Yamaha DX-21 is really cool and it’s been fun jamming with it today. The Yamaha DX-21 is a great find I think and definitely a keeper. Here’s a demo of the Yamaha DX-21 in action found on Youtube.